This might be an extreme take on the all-too-common client request of "get it done quickly," but it serves as an excellent benchmark of what can be done in a short amount of time. Odds are, you won't ever be asked to do a full post-production retouch in such a short amount of time, but the idea behind what Aaron Nace of PHLEARN is showing here is solid: with the right tools and knowledge you can streamline your workflow with extreme effectiveness. For the full tutorial, head on over to PHLEARN and while you're there, don't forget to check out their Pro Tutorials. Same here. If he had left out the skin brushing it would have been a lot better. Image on the right is the edited one. Texture was gained if anything; not lost. Not sure what was posted before I looked at this page. Aaron *never* is a proponent of killing off texture in skin. Sorry, gotta disagree. You watch the vid from 5:39 and when he turns off the layers, it shows the original image (the one pictured on the right in the article - you can tell by the 'blotchy' skin on the forehead that was retouched out). All I'm saying is that the article in its original, un-edited version was incorrect, and that, to my taste, I prefer the feel of the original (right). 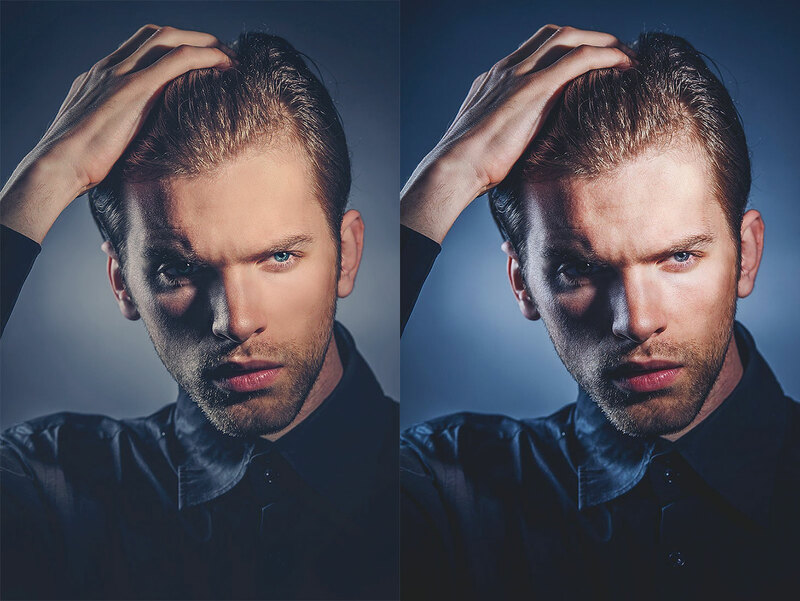 The retouched image (left) may be seen as more 'editorial' in the industry, but I can't help but feel its somewhat muted in comparison to the original. You're absolutely right; I stand corrected. I just watched the video. I'm a huge fan of Aaron Nace and have learned so much but I would have to agree and say that the original photo is better than what it was edited to. I don't know what is more "editorial" as I'm not in that side of the industry but I think the edits muted the strong crisp feel of the original. I like the concept, the lighting and the final image is good. Hoever someone went overboard with the sharpening. So what he did is lowered contrast, fucked up white balance and got rid of skin texture. The sharpening is also totally unnecessary for a already heavily sharpened image. This is my photo :) I really appreciate Aaron doing this tutorial on my picture. My edit is on the right. I like some thing better on my edit, some on Aaron's. Lately I've been using the frequency separation technique for my skin work . I keep a copy of the texture layer around and find that I duplicate that towards the end of my work and move the copy up top and use that as the sharpening and skin texture layer. I do some skin "painting" like Aaron does throughout the retouching and when you plop that original skin texture on top with a layer mask and reveal it slightly it looks about as perfect as can be.